It has been awhile since I completed a Landslide of the Week. I think the Sanford Pasture Landslide is a good candidate since it has gotten so much press lately and what we know about it is fairly limited (at least, in publications). The formation of the Sanford Pasture Landslide started back in the late Miocene and early Pliocene epochs, where the eruptions covered much of Eastern Washington with basalt, known as the Columbia River Basalts. Between the eruptive cycles, sandstones, generally fluvial in origin, deposited on top of the flows, only to be covered by the next pulse of magma. These are known as interbeds and are suspected to be Ellensburg Formation. 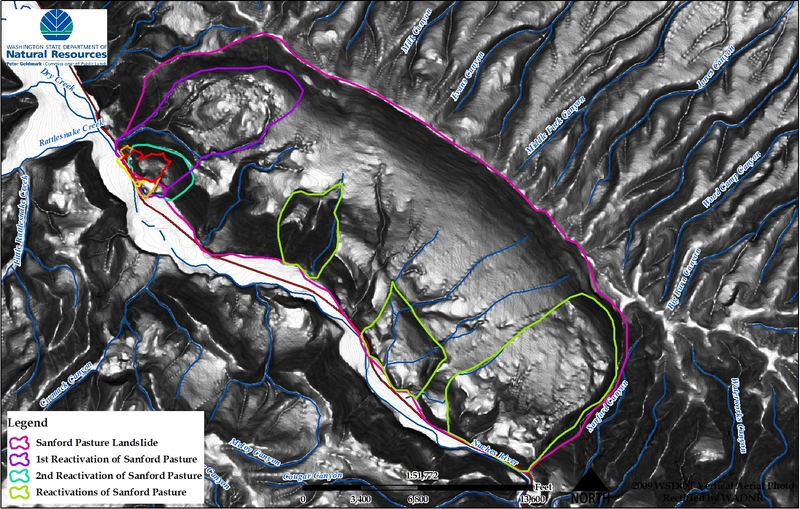 At the Sanford Pasture Landslide, the dominant flows of the Columbia River Basalts are the N2 and R2 flows of the Grand Ronde Basalts, some of the last recorded flows of the eruptive cycle. Much of the deposits were lain horizontally, but as we know them today, the geologic units are folded and faulted. This is accomplished by stress from the subductive oceanic plate pushing its way underneath the continental crust that we live on here in Washington State. The force of the collision compresses Washington State, forming wrinkles and faults as the stress is dissipated through the plate. In the Naches area, this folding resulted in the formation of Cleman Mountain as a steeply dipping anticline. The area was not able to just fold to reduce the stress on it, it faulted as well, forming the Nile Thrust Fault. The failure mechanism is something that we probably do understand. The oversteepened anticline combined with the weak interbed layers of sandstone created a perfect weak plane for the above rock to slide on. An earthquake, probably on the Nile Thrust, or perhaps something larger like a Cascadia Subduction Earthquake, probably reduced the restraining forces enough to start the material moving downhill, depositing where we see it today (more on that below). These events occurred after the Columbia River Basalts and interbeds were lain in place, giving us a limiting age on the landslide. Given the flow age, coupled with the folding and faulting of the area, the general estimation of the landslide is 2 million years old. Determining the age of a landslide is often difficult. Dates can be acquired through a couple of different methods, most often coring into sag ponds, or lake bed deposits (on older landslides that have dammed rivers), or by coring old tree snags that have been drowned. The goal is to find datable material or stratigraphic reasoning to determine a specific of general age. For the Sanford Pasture, there are no found lake bed deposits up valley of the landslide initiation and the landslide is too old to support sag ponds that formed during its initial movement. The general thought is that the landslide occurred prior to glacial times. 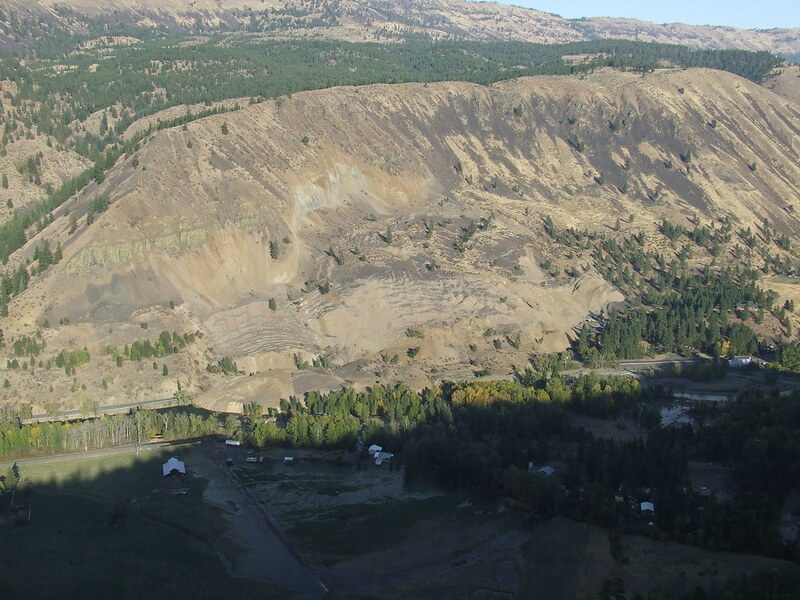 The Sanford Pasture landslide moved across what is today the Naches Valley and deposited material almost a mile inward from the valley’s edge. During this time, the Naches Valley was less incised and contained much less water (remember, no lake beds deposits), so whatever damming of the paleo-fluvial system here, it was minor. During the age of glaciation in the Quaternary Period (predominantly alpine glaciation influences at the Sanford Pasture). Advances and retreating of the glaciers, combined with their constant run-off carved much of the valleys and fluvial systems we see today in the area. I should point out, I don’t think any glaciers have reached the Sanford Pasture Landslide area. The melt water flowing through what is now the Naches Valley would have eroded out the landslide and continued to incise into the valley, exposing in-place Columbia River Basalt Flows on the western side and eastern side of the valley. Unfortunately, all of this erosion created yet another unstable element into the system. The eroding river removed much of the lateral strength that the landslide had when its mass continued for another mile. It literally shortened the landslide by half. In response, the Sanford Pasture landslide didn’t fail as one large piece, but as smaller failures within the older landslide material. This image of the Sanford Pasture Landslide is a quick drawing of the possible major landslide events. There are dozens of smaller events throughout the landslide. The most difficult part to figure out is the northwest section of the landslide, that appears to have gone through a series of deformations, probably more than I have drawn here. That is something we are going to try and unravel down the road. It is difficult to determine if the last major movement was on the eastern or western section of the landslide. The only sag pond that exists on the landslide is on the eastern side, known as Dog or Mud Lake. This makes me suspect that the last major movement has been on the eastern side. Other evidence also suggests that the morphology is younger, less stream development and incision on the eastern side. Regardless, the western side is the side where the Nile Landslide initiated off of and probably has a much more active, smaller landslide activity. The area where the Nile Landslide has occurred has experienced several large landslide events. Looking at the history, the Nile Landslide is probably the 4th in a series of movements in the area (Sanford Pasture, Largest block in purple, smaller block in green, then Nile Landslide). That is the larger movements. Further evidence looks like smaller landslides have been recent in the same area as the Nile, maybe being able to form and move every couple of hundred years (not sure how far back this might go, but maybe a thousand or two years, depending on when the major movement of the largest block in purple and smaller green block occurred). Granted, that is a bit of speculation. In the 1940’s photo, there is clearly areas without vegetation that look hummocky that might indicate recent movement, like within the last 50 years. Comparing that 1940’s photo to today, areas that were once void of vegetation now are supporting sparse tall trees, indicating a possible regrowth period. Maybe we are looking at something that is geologically common here. The last work, Sanford Pasture Reactivation. This has been pushed around in the media about State Geologists concerned about future movement of the Sanford Pasture Landslide. They are right, we are concerned, I being on of them. The removal of lateral support by the Nile Landslide could reactivate something larger uphill. Remember, this is really torn up landslide material, it has its strength reduced and it looks like it is sliding on something that is fine grained. Reactivation of the Sanford Pasture Landslide, worst case scenario, would completely block the Nile Valley, forming a massive lake (Lake Naches?) behind the debris. The threat would then continue into the competency of the material to hold the water, a race to safely dewater the lake and the possible major dam-burst flood into the Yakima Valley. The destruction of that last one would be unlikely, but something we have not seen the likes of in modern society. These are spectrograms, which plot frequency content of the seismogram the vertical axis against time on the horizontal axis. The number on the horizontal axis is hours after the start of Saturday, for example, 34 is 10am Sunday. I think you can see more detail on them by looking at them in a graphics program. This 1st plot runs from 25 to 35 hrs, the bright red spot is the landslide noise at 10am Sunday. The vertical axis is frequency – 0 at the top grading to 10Hz at the bottom. The 5Hz sound of the landslide grows from imperceptible on the left until the racket at 34, then fades slowly.The industrial source at 9Hz is visible as the pulsation on the bottom, and the pops are too short to see in this plot. The 5-10Hz smears in the lower right are probably unrelated cultural noise that starts at daybreak after a quiet night. Close-up of the noisy part, spanning about 1.3 hrs or 80 minutes. This is the noisiest part of Saturday, hours 5-21, on the same color scale. More cultural noise 5-10Hz starts about 7am, as appeared above for Sunday. There is not a signal similar to the 5Hz band above, which is apparently how the landslide appears on this station. Also, the patches of signals present do not match the timing of energy on the other nearby station ELL. So maybe some Saturday landslide noise could be invisible on this plot, but it would be less than the noise on Sunday. Here is an example of the pops at their most frequent, 2 hours before the big noise. The plot spans about 15 minutes, and the pops appear on the upper half of the plot, 1-5Hz, and agree in timing with pops seen on station ELL. This is the burst at 7:38 Sunday in a 15 minute window. Note the strong 1-2Hz energy, more so than during the rest of the landslide-related signals, and most of the action takes place within 1 minute. This is the 4:55am Sunday burst in a 15-minute window, weak but with the same frequency range and gradual onset as the other slide related shaking. This sort of data allows us for form a timeline to the landslide movement. 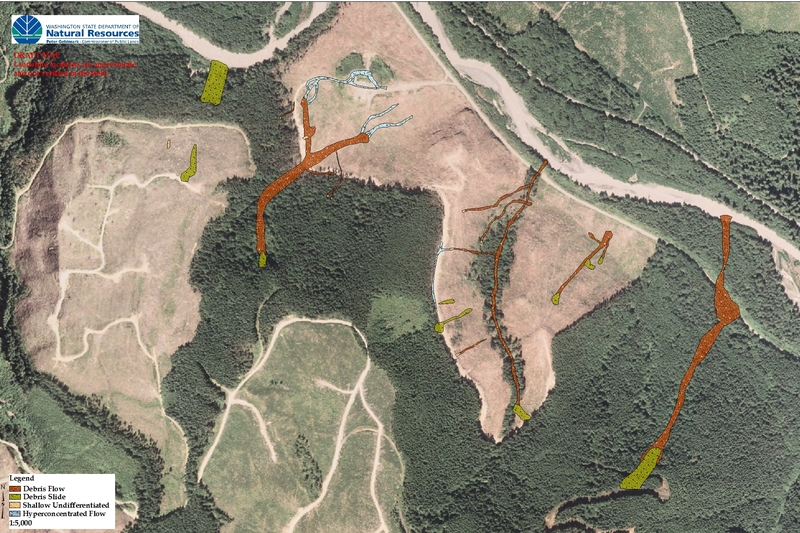 Combined with eye witness reports, we can reconstruct the various parts of the landslides and when they moved. With that data, we can look at the places of initial movement and evaluate the pre-failure conditions to see if there is any likely event that might have triggered this landslide. Vary preliminary data, however, has been suggesting that landslide movement might have been prior to 2002 (we are still working on this), but this movement was quite slow, just about creeping. I am currently working on tying together a series of aerial photos to determine the amount of movement and hopefully to constrain the first start of movement. I am not sure if Jack (a geologist here at DNR who works in Forest Practices, who created this map) intentially put the Woodshed Restraint or not. Either way, it is a good term. As the landslide came down, it hit a block of material, probably an old landslide block. The weight and movement of the landslide behind it slowly pushed the old block (which on the surface is a small hillside). The block had many fissures forming and the surface ruptures trended north-south, lining up with the stress from the main landslide mass. 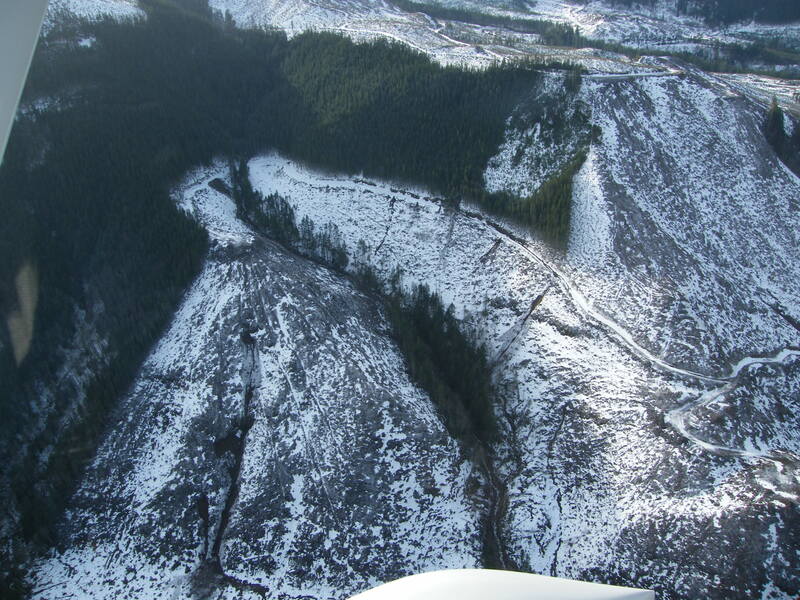 On October 11, 2009, Lorraine Powell (DGER), Jack Powell (FP), and Isabelle Sarikhan (DGER) investigated a landslide on Highway 410 approximately 10 miles west of Naches. 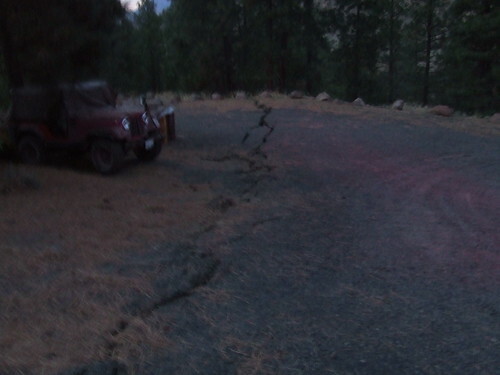 The landslide has damaged approximately 12 structures (residential houses and quarry buildings), buried equipment in a quarry, has blocked and diverted the Naches River, and completely closed Highway 410. No injuries or deaths were reported as a result of this landslide, however, many of the surrounding houses have been evacuated and a significant amount of people have been displaced. As the landslide is moving into the valley, the weight of the landslide mass and movement appears to have deformed part of the soft sediment valley floor, further threatening houses in the valley. The landslide is still active and will probably continue moving for some time. On the west side of the landslide, movement appears to have slowed during our investigation on Oct. 11, although cracks near the main landslide scarp could indicate future landslide propagation to the west. The east side of the landslide is much more active. A small hill acting as a buttress from the original movement of the landslide is in danger of failing. Sounds of groaning and deformation of the hillside indicated high amounts of stress within the landslide mass. In this section, about 6 houses are threatened or are actively being damaged by the landslide. 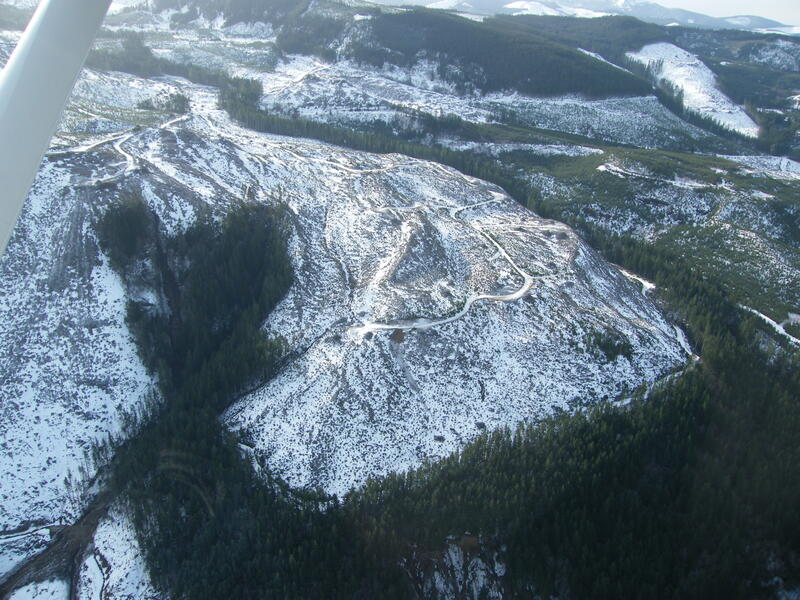 The presently moving area of the landslide is more than 80 acres; with the potential for other parts of the slope activating that could increase the area by another 15 acres. The landslide is approximately ½ mile long ¼ mile wide and with depths varying from 50-60 feet covering the highway to several hundred feet higher up. The landslide mass moved in blocks, some translational, others rotational. As the landslide continues to move into the valley, deformation will probably continue, potentially damaging houses that are not in the direct path of the landslide. Currently, the water is being diverted into an abandoned river channel. The diverted river is flooding one building and blocking the only detour road (Nile Road) around the landslide. Deformation has also buckled and made the detour road (Nile Road) impassable. 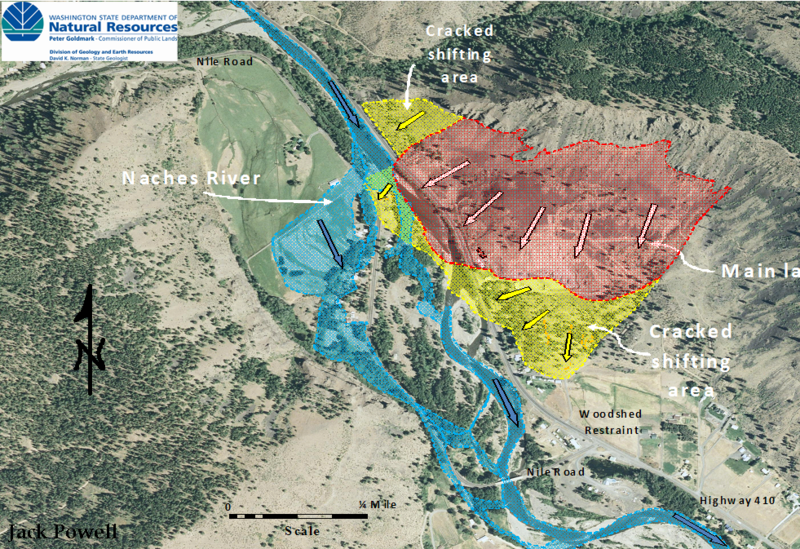 The material blocking the Naches River will be difficult to remove to restore the channel, and the landslide mass over Highway 410 will also be very difficult to remove due to stability issues. Long term closure of Highway 410 over the original roadway path should be expected. 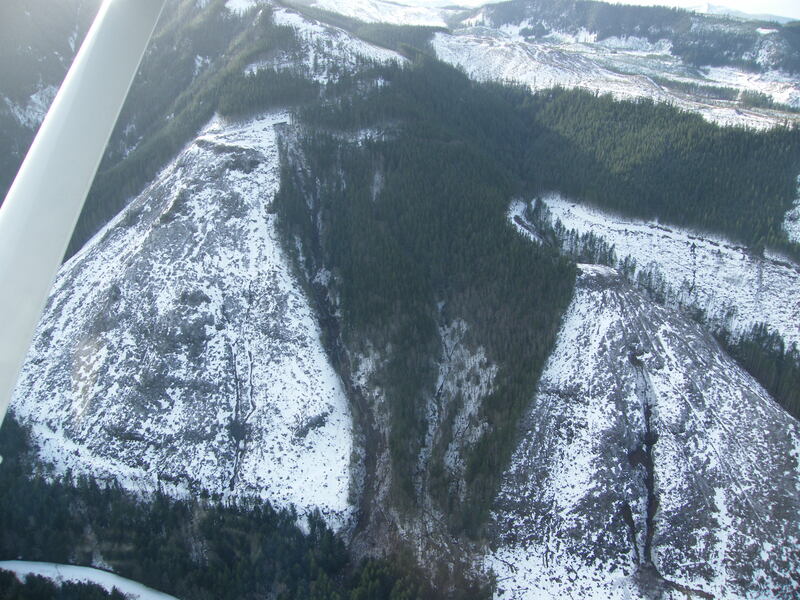 I’ll try and post more later today, the landslide is part of the Sanford Pasture Landslide, one of the larger deep-seated landslides in Washington State. It has an interesting history. I’ll also post more about the anatomy of this landslide and some of the other interesting aspects that aren’t being reported. Harvest related landslides have been in the public eye for awhile. Hal Bernton and Justin Mayo of the Seattle Times (and photographer Steve Ringman) have really brought landslides and logging into the minds of people in Washington, if not many places in the nation. Science backs that logging can cause landslides with a lot of research focused on rooting strength and the 3-15 year (or so, see Loughlin and Ziemer, 1982) window of weakening roots (variable with climate, soil, tree species, among other things). Perhaps less studied are canopy coverage and its impacts to landslides. A study in Canada (Horel, 2006) has shown that in their study area, landslides failed in the years after harvest and reduced in landslides when rooting strength was at its lowest. So, perhaps we have a myriad of factors for how trees can influence landslides. That is just an introduction to the following area. I have been working on digitizing landslides from the January 7-8th storm with help from Trevor Contreras and Kelsay Davis-Stanton. 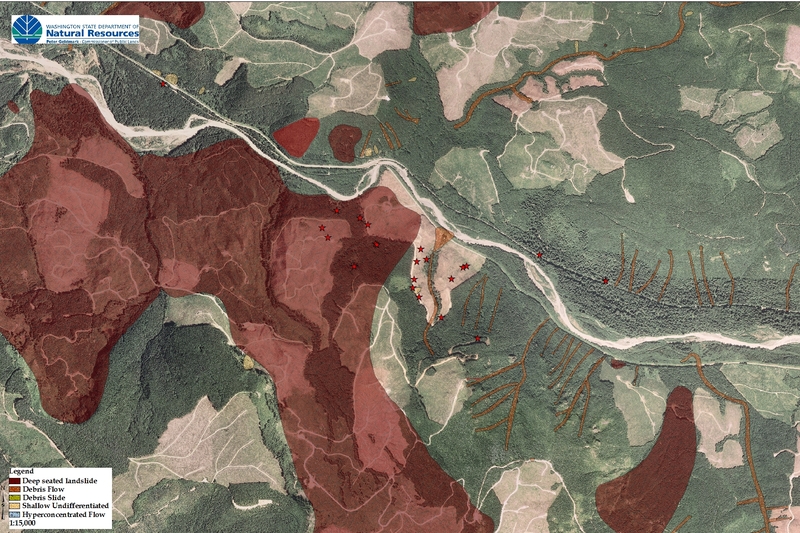 A lot of the landslides I digitize in are in a mixture of timber ages, from clear cut areas (0-5 years), young stands (5-15 years), and submature timber (15-50 years). However, there are areas where we see a higher incident of landslides in a single age of trees or specific landuse. Historically, this area has had many debris flows and is covered in deep-seated landslides. The red stars indicate where landslides have initiated from the January 7-8th, 2009 storm. 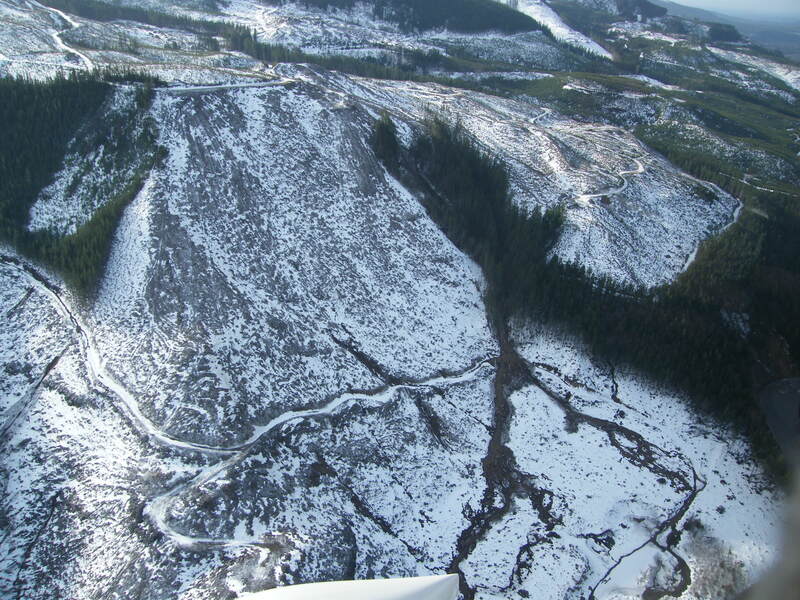 So, is this clearly a case of clearcuts causing landslides? Lets look at some of the data of this area (this data is for example use only and is very much in draft form). Eight landslides initiating in clearcuts, three in submature timber and eight in roads, is that clearly a clearcut answer? Not really, first we would need to normalize the data, that is quantify the size of different landuses and then divide that with the landslides. That way, if there is, say, 16 acres of clearcuts and 6 acres of submature timber, then the data would not suggest that landslides were more frequent in either landuse. In this area, roughly speaking, there are 11,200 acres of clearcut and 6,400 acres of submature timber. Normalized that would come out to about 7 landslides/1,000 acres for clearcuts, 5 landslides/1,000 acres for submature timber. Not that this sample is statistically large enough, but the difference between the two landuses is not all that significant. This data doesn’t mean that clearcuts aren’t causing landslides, but the rate of landslides is similar to that of submature timber. Landslides are a naturally occurring event, but can sometimes be aggravated by various landuses. The real question is; is the rate of landslides greater than that of natural rates, that is, is our management of the forests creating a greater number of landslides. With that, we would have to look at historical records to determine a pre-harvest landslide rate and compare that to the various landuses today. Unfortunately, such data would be very difficult to create and the accuracy for a specific area would almost be impossible. Some data exists for site specific areas, but no statewide data exists. Feel like arguing in a circle for awhile? We are faced with a question that cannot be clearly answered with our given knowledge of landslides in Washington, but we can continue to collect data and make inferences as to how landuse might be impacting our land.